This article is about the international news and current affairs channel. For the BBC radio network, see BBC World Service. BBC World News is the BBC's international news and current affairs television channel. It has the largest audience of any channel, with an estimated 99 million viewers weekly in 2015/16, part of the estimated 265 million users of the BBC's four main international news services. Launched on 11 March 1991 as BBC World Service Television outside Europe, its name was changed to BBC World on 16 January 1995 and to BBC World News on 21 April 2008. The service is aimed at the overseas market, similar to DD India, WION, DW, France 24 and RT. It broadcasts news bulletins, documentaries, lifestyle programmes and interview shows. Unlike the BBC's domestic channels, BBC World News is owned and operated by BBC Global News Ltd., part of the BBC's commercial group of companies, and is funded by subscription and advertising revenues, and not by the United Kingdom television licence. It is not owned by BBC Studios. The channel originally started as BBC World Service Television and was a commercial operation. The British government refused to fund to the new television service using grant-in-aid. (BBC World Service radio was funded by a grant-in-aid from the Foreign and Commonwealth Office until 2014.) The channel started broadcasting on 11 March 1991, after two weeks of real-time pilots, initially as a half-hour bulletin once a day at 19:00 GMT. BBC World started broadcasting on Monday, 16 January 1995 at 19:00 GMT and became a 24-hour English free-to-air international news channel. BBC Prime started broadcasting on Monday, 30 January 1995 at 19:00 GMT and became the BBC's light entertainment channel, later renamed BBC Entertainment. BBC World's on-air design was changed significantly on 3 April 2000, bringing it closer to the look of its sister channel in the UK which was then known as BBC News 24, the on-air look of which had been redesigned in 1999. The look of both channels was made up of red and cream and designed by Lambie-Nairn, with music based on a style described as 'drums and beeps' composed by David Lowe, a departure from the general orchestral nature of music used by other news programmes. On 8 December 2003 a second makeover, using the same 'drums and beeps' style music but new graphics took place, although on a much smaller scale to that of 2000. The music was changed slightly while the main colour scheme became black and red, with studios using frosted glass and white and red colours. Later in 2004, the channel's slogan became Putting News First, replacing Demand a Broader View. The channel's present name "BBC World News" was introduced on 21 April 2008 as part of a £550,000 rebranding of the BBC's overall news output and visual identity. BBC World News later moved to the renovated studio vacated by BBC News 24 (now the BBC News Channel). New graphics were produced by the Lambie-Nairn design agency and music reworked by David Lowe. BBC World News relocated to Broadcasting House from its previous home at Television Centre on 14 January 2013. This was part of the move of BBC News and other audio and vision departments of the BBC into one building in Central London. Broadcasting House was refurbished at a cost of £1 billion. A new newsroom and several state-of-the-art studios were built. Live news output originates from studios B and C in Broadcasting House with some recorded programming from Broadcasting House studio A and the BBC Millbank studio. The BBC World News newsroom is now part of the new consolidated BBC Newsroom in Broadcasting House along with BBC World Service and UK domestic news services. Previously, the channel was broadcast in 4:3, with the news output fitted into a 14:9 frame for both digital and analogue broadcasting, resulting in black bands at the top and bottom of the screen. On 13 January 2009 at 09:57 GMT, BBC World News switched its broadcast to 16:9 format, initially in Europe on Astra 1L satellite, and Eutelsat Hot Bird 6 satellite to other broadcast feeds in the Asian region from 20 January 2009. As a result of the move to Broadcasting House, BBC World News gained high-definition studios and equipment to be able to broadcast in high-definition. On 5 August 2013, BBC World News was offered as a High Definition (HD) feed across the Middle East when it launched its international HD channel on Arabsat. Arabsat was the BBC's first distribution partner in the Middle East to offer the channel in HD. On 1 April 2015 BBC World News in English started broadcasting in high definition from the 11.229 GHz/V transponder on Astra 1KR at the 19.2°E orbital position, available free-to-air to viewers with 60 cm dishes across Europe and coastal North Africa. BBC World News claims to be watched by a weekly audience of 74 million in over 200 countries and territories worldwide. BBC World News is most commonly watched as a free-to-air (FTA) channel. The channel is available in Europe and many parts of the world via satellite (FTA) or cable platforms. In the United States, the channel is available through providers such as Cablevision, Comcast, Spectrum, Verizon FiOS, and AT&T U-verse. As of 2014, US distribution and advertising sales for the channel are handled by AMC Networks, who are the minority partner for the BBC's entertainment channel BBC America. In addition, BBC World News syndicates its daytime and evening news programmes to public television stations throughout the US, originally maintaining a distribution partnership with Garden City, New York-based WLIW that lasted from 1998 until October 2008, when the BBC and WLIW mutually decided not to renew the contract. BBC World News subsequently entered into an agreement with Community Television of Southern California, Inc., in which Los Angeles PBS member station KCET (which was a public independent station from 2011 to 2018) would take over distribution rights to BBC World News America (the KCET agreement has since been extended to encompass a half-hour simulcast of the 90-minute-long midday news bulletin GMT, which airs in the US as a morning show, and a weekly edition of the BBC newsmagazine Newsnight). PBS separately began distributing another program aired by the channel, Beyond 100 Days, as a tape-delayed late night broadcast on 2 January 2018, as an interim replacement for Charlie Rose. Unlike GMT and BBC World News America, Beyond 100 Days is distributed exclusively to PBS member stations as part of the service's base schedule. BBC World News began streaming its content on YouTube on 16 July 2017. The channel is available in the US as part of Sling's World News add-on package. From 2012 until it closed in 2016, BBC World News was available on LiveStation. TV platforms in the UK (i.e. Freeview, Sky, BT TV, Freesat, Virgin) do not officially offer BBC World News as a standalone full-time channel because it carries and is funded by advertising (BBC's domestic channels are funded by a television licence fee which households and establishments that want to watch television programmes as they are being broadcast must pay), although it can be easily received due to its 'free-to-air' status on many European satellite systems, including Astra and Hot Bird and is available in selected London hotels. BBC World News can also be viewed in the public areas of Broadcasting House (the lobby and café). However, some BBC World News programmes are officially available to UK audiences. Such programmes air on the BBC's domestic channels and some are available on-demand on the BBC's iPlayer. From 00.00 to 05.00 UK time, the top-of-the-hour news bulletins on BBC World News are simulcast on the BBC News Channel. At 01.30 weekdays, Asia Business Report and Sport Today also air on both channels. There is a simulcast of the 05:00 UK edition of The Briefing and Business Briefing on BBC One and the BBC News channel. This programme was previously branded as 'The World Today' (later a generic BBC World News bulletin) and World Business Report respectively. At 08.30 UK time, BBC Business Live airs on the BBC News Channel. BBC World News also produces a version of Outside Source at 21:00 UK time Monday-Thursday (seen on the BBC News Channel), World News Today at 19:00 Monday-Friday (seen on BBC Four), and 21:00 Friday-Sunday (seen on the BBC News Channel). World News Today replaced The World, which had been broadcast as a simulcast on BBC Four between 2002 and 2007. Both World and the BBC News Channel have also occasionally had to simulcast the same news programme due to strike action or technical issues; this occurred in 2003 when Television Centre in London was affected by electrical problems. BBC World News – International news. GMT – International news, including business and sport. Impact – Global news as it affects audiences in Asia. Global – International news and analysis. Outside Source – Discussion and analysis of news topics. Newsday – Live from Singapore and London, news and analysis from both an Asian and global perspective. BBC World News America – News from America and around the world, live from the BBC's Washington DC bureau. Focus on Africa – BBC World News' flagship African news programme, with news, business and sport from the continent. Beyond 100 Days – Katty Kay in Washington and Christian Fraser in London report on international news, with a focus on the UK, Europe and the US (previously branded as 100 Days and 100 Days +). The Briefing – Sally Bundock with news, business, and sports from BBC News. Business Live – Broadcast live from London. World Business Report – Business news analysis. Asia Business Report – Business and market news in Asia, live from Singapore. Sport Today – International sports news and results. Africa Business Report – Weekly African business news programme. Click – Technology programme aimed at non-technical audiences. Dateline London – Foreign correspondents based in London discuss the week's international news. The Travel Show – A unique insight into the world of travel. HARDtalk – In-depth interviews with famous personalities from all walks of life. Newsnight – A weekly round up of news and current affairs hosted by Evan Davis. Our World – Documentary series. Politics Europe – Monthly programme usually broadcast on a Friday which covers political news across Europe, analysing both the situation in Brussels as well as within individual European nations. Filmed in exactly the same format as the BBC Two programme, the Daily Politics, presented by Andrew Neil or Jo Coburn. Also broadcast on BBC Parliament. Reporters – A weekly showcase of the best reports from the BBC's global network of correspondents. Talking Movies – A guide to film, from Hollywood blockbusters to documentaries and world cinema. Half-hour BBC World News bulletins are made available to Public Broadcasting Service stations in the US through Los Angeles' KCET, a non-commercial independent public television station which has been separate from PBS since the beginning of 2011 due to a rights fee dispute. 80 to 90% of Americans are able to receive the bulletins, though broadcast times vary between different localities. The programme is broadcast on several PBS stations in markets such as New York City and Washington DC. On PBS stations, BBC World News is not broadcast with traditional commercials (the breaks are filled with news stories) but omits the Met Office international weather forecast at the end of the programme, replacing it with underwriting announcements. The PBS broadcasts are tape-delayed on some stations. BBC America airs a three-hour block of BBC World News programmes from 05:00 to 08:00 on weekdays. Met Office forecasts are removed, and it is broadcast with advertisements. BBC World News bulletins also appear on Hong Kong TVB English Channel instead of an NBC Nightly News simulcast from NBC News via its East Coast Feed at 07:30 Hong Kong Time (18:30 New York City Time), China 24 simulcasting on CGTN at 20:15 Beijing/Hong Kong Time and News at 7:30 at 19:30 Hong Kong Time. In Singapore, the English daily evening-nightly flagship mainly news bulletins appear on: MediaCorp's Channel NewsAsia instead of Singapore Tonight at 22:00 Singapore Standard Time. Many airlines from across the world also play pre-recorded extracts of the BBC World News, have text headlines from it or have a full bulletin available on the in-flight entertainment systems. Airlines showing BBC World News include Garuda Indonesia, Emirates Airlines, Qatar Airways, Malaysia Airlines, Singapore Airlines, Royal Brunei Airlines, Myanmar Airways International, Cathay Pacific, Air New Zealand, Air Canada and Qantas. Another BBC World News programme, the hour-long BBC World News America, aired on BBC America at 19:00 Eastern Time. A second broadcast at 22:00 Eastern Time ended in 2010 when BBC America introduced a second feed for the western time zones of the US on 18 February 2011, it was announced that BBC World News America would no longer be broadcast on BBC America and would instead be broadcast only on BBC World and local PBS stations in the US as a 30-minute program. These broadcasts began with the statement: "Welcome to BBC World News on board the Singapore Mass Rapid Transit and Hong Kong Mass Transit Railway". The short bulletin was updated twice a day, and has since been replaced by a similar programme from MediaCorp's Channel NewsAsia. Travellers on the Heathrow Express rail service between London Paddington and London Heathrow Airport could watch a summary of the headlines from BBC World News on the LCD screens provided. For full list of current presenters, see List of BBC newsreaders and reporters § BBC World News. BBC World News is, for the most part, the same channel all over the world; the commercials are intended to be the only differences. However, there are some regional programming variations. For example, a number of programmes are made exclusively for regional viewings, such as Indian feeds, and The Record Europe, which is only broadcast in Europe. Also, the weather forecasts focus more on the area the viewer is watching from. On most feeds of BBC World News, when there are no commercials being inserted by the cable or satellite provider similar to other channels, the break filler shows promotions for upcoming programmes on the channel. During BBC News, a news story that has not been promoted airs during what would be the commercial break. This is the case on the broadband versions of BBC World News, and on versions of BBC World News aired in the US on Public Broadcasting Service (PBS) stations. However, there are some global commercials and sponsorships which air throughout the network. On 11 September 2007, the break filler was redesigned and now more closely resembles previous versions. [clarification needed] The promotional videos now fill the entire screen and are interspersed with news and market updates, schedules, and other information. There is also no longer a unifying music composition. Instead, each 20-second promotional video uses music selected from a handful of themes, which have some unifying musical characteristics. The information screens, such as the 10-second plug for the website or YouTube channel, and the 15-second weather/time/coming up screens each feature their own theme. The colour theme was updated following the relaunch of the channel in April 2008. Since its inception, and more so since its extensive association with the BBC News channel, the countdown to the hourly news bulletin has been a feature of the channel's presentation, accompanied by music composed by David Lowe. The current style of countdown features reporters and technical staff in many different locations working to bring news stories to air. The countdown can range from 45 seconds to as little as 3 seconds. BBC World News was named Best International News Channel at the Association for International Broadcasting Awards in November 2006. It won a Peabody Award in 2007 for White Horse Village and another in 2009 for Where Giving Life is a Death Sentence. ^ "Ch.565 BBC World News Premium service". SKY PerfecTV!. ^ "BBC – BBC's global audience rises to 372m – Media Centre". Retrieved 31 July 2017. ^ BBC. "BBC News – About BBC World News TV". BBC. ^ "BBC World Unveils A New Look and a New Schedule – Scoop News". Retrieved 23 June 2016. ^ Sabbagh, Dan. "The news from the BBC: its £1bn new base is finally coming on air". Guardian. Retrieved 26 December 2012. ^ "BBC World News goes widescreen". YouTube. 13 January 2009. Retrieved 22 August 2010. ^ "BBC World News launches HD service in Europe". BBC Media Centre. 1 April 2015. Retrieved 29 April 2015. ^ "About BBC World News TV". BBC. Retrieved 11 July 2013. ^ "Where and how to watch BBC World News". BBC. Retrieved 11 July 2013. ^ "BBC World News launches on AT&T U-verse". BBC. 28 February 2014. Retrieved 27 February 2015. ^ "AMC Buys Half of BBC America to Bolster Pay-TV Leverage". Bloomberg L.P. Retrieved 18 December 2016. ^ "AMC Networks Pays $200M For 49.9% Of BBC America". Deadline.com. Retrieved 18 December 2016. ^ Lawrie Mifflin (30 July 1998). "INTERNATIONAL BUSINESS; Long Island PBS Channel To Get Live BBC Newscasts". The New York Times. The New York Times Company. Retrieved 24 May 2017. ^ Paul McNally (30 April 2008). "BBC World News signs new US distributor". CampaignUS. Retrieved 24 May 2017. ^ Elizabeth Jensen (2 October 2002). "BBC Tailors Its News Broadcast". Los Angeles Times. Tribune Publishing. Retrieved 24 May 2017. ^ "KCET Expands Audience Reach for 'BBC World News' With Station Upgrades and Improved Time Periods; Cleared in Top 30 Markets With Six New Stations Added to Line-Up" (Press release). BBC. 24 September 2008. Retrieved 24 May 2017 – via BusinessWire. 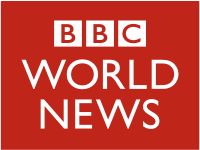 ^ "New-Look 'BBC World News' Uses Unrivaled Newsgathering Resources to Bring PBS Audiences News from around the World" (Press release). BBC. 1 October 2008. Retrieved 24 May 2017 – via BusinessWire. ^ "KCET Picks Up 'BBC World News' Distribution From WLIW". TVWeek. 28 April 2008. Retrieved 24 May 2017. ^ "PBS and BBC Announce "Beyond 100 Days" Coming to PBS in New Late-Night Timeslot" (Press release). PBS. 19 December 2017. Retrieved 11 June 2018. ^ Daniel Holloway (19 December 2017). "BBC's 'Beyond 100 Days' Takes Charlie Rose's Former PBS Slot". Variety. Penske Media Corporation. Retrieved 11 June 2018. ^ "BBC America and BBC World News now on Sling TV". Sling. Retrieved 7 August 2016. ^ BBC. "Programmes – BBC World News". BBC. ^ "The Briefing – BBC News". BBC. ^ Gibbons, Kent (18 February 2011). "'BBC World News America' Shifts To BBC World News". NewBay Media. Archived from the original on 27 September 2012. ^ "Key Dates". BBC World News. Retrieved 22 August 2010. ^ "2007 Peabody Awards: White Horse Village (BBC America)". University of Georgia. Archived from the original on 27 January 2015. ^ "2009 Peabody Awards: Where Giving Life is a Death Sentence (BBC America)". University of Georgia. Archived from the original on 12 September 2014. This page is based on the Wikipedia article BBC World News; it is used under the Creative Commons Attribution-ShareAlike 3.0 Unported License (CC-BY-SA). You may redistribute it, verbatim or modified, providing that you comply with the terms of the CC-BY-SA.